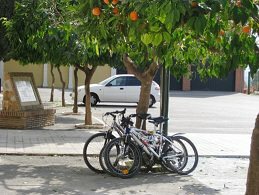 On our tours you will have to consider if you will bring your own bike or hire one from us. We offer high quality bicycles for rent on all of our tours, but, as some people like to bring their own, this is an optional extra rather than included in the price of the tour. The main advantage of hiring a bike from us is the convenience. You don't have to spend time, effort and money in packaging you own bike and transporting it by plane or train (if it is accepted). We will set the bike up how you like it, so the more information that you can provide on the booking form the better. However, we are experienced in sizing, so if you only know your height, we can get the appropriate size and make any adjustments when you arrive. We have two types of bike available for hire: road bikes and sport hybrids. Sport hybrid bikes are a cross between a road bike and a mountain bike. They have the same size wheels as a road bike, but with wider tyres and flat handlebars. They also have gearing more similar to a mountain bike - favouring riders that like to cycle at a more leisurely pace. We usually recommend sport hybrids for shorter tours (less than 50km per day) and road bikes for longer distances (especially tours in the mountains with significant climbing). However, both types are available on all of our tours, so choose whichever you are more comfortable with. Our bicycles are high quality models including Giant, Rose and Canyon. Please check our rentals section for more details of the specifications of the type of bikes that we offer. 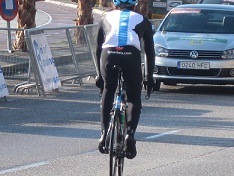 The road bikes we use on our holidays are 22 speed (Shimano 105/Ultegra) and with full carbon frames. Our road bikes are also optimised for use in the mountains, so they all have a compact chainset (50-34) and a generous cassette (11-28 or 11-32 teeth). Our premium Rose bikes weigh just 7kg. Our sports hybrid bikes offer a more upright position. They are slightly heavier than the road bikes but have a wider range of gearing to compensate. 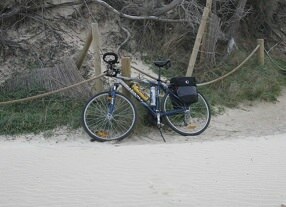 We also offer electric bikes on most of our tours - although an additional supplement is sometimes payable for these. We can also do some modifications to the bikes if you request before hand. For example, if you want spd pedals, toe clips or a small saddle bag, we can add these. The bike will be your responsibility for the duration of the holiday, so be sure to take good care of it! If you choose to hire a bike from us it is worth considering if there are any accessories that you could bring with you. Some cyclists who hire from us like to bring, for example, their own saddle or pedals to make the bike more comfortable for them. We can provide some pedals (Shimano SPD / SPD-SL / Toe Clips), but for most others you will need to bring them yourself. All of our bikes come with a water bottle, odometer and saddle bag (including inner tube, tyre levers and a multi-tool). If you would like any other accessories please contact us.